I've mentioned before that, back in the day, my friends and I didn't really distinguish between "D&D" and "AD&D." Indeed, the distinction between them was somewhat baffling to us, since we freely bought and used products for both game systems to use in our weird Holmes/AD&D/Moldvay mishmash campaigns. A good case in point of this principle in action was 1982's The Lost City, the final part of what I call Tom Moldvay's "Pulp Fantasy Trilogy," the previous two installments being The Isle of Dread and Castle Amber. That the module was sold as part of the B-series aimed at players of the 1981 Basic Rules didn't matter one whit to me. I simply thought the module's premise was really cool, which trumped any consideration of TSR's ridiculous attempts at brand management. The Lost City's connection to pulp fantasy is readily apparent, as it presents a decadent subterranean civilization of great antiquity (Cynidicea) in the thrall of a foul alien being known as Zargon, whom many worship as a god. The player characters are flung headlong into this civilization, which is riven with factions and secret societies, each of which has its own plots and goals. Success in this module is judged at least in part by how adeptly the PCs can navigate the treacherous waters of Cynidicean society in order to achieve their own goals, whatever they may be. What's interesting is that the module itself consists largely of a dungeon crawl inside a ziggurat buried in the sand. The ziggurat itself is a well-presented low-level dungeon (with the obligatory wight encounter -- nearly every introductory module includes an encounter with these undead, it seems), but what attracted me to the module was the aforementioned subterranean civilization and its factions, which are only briefly sketched out in the actual text of the module. Yet, that brief sketch is pregnant with ideas, many of which sustained my campaign for weeks and months. What Moldvay did here is nothing short of remarkable. He presented us with a mini-sandbox campaign setting that reminds me both of Howard's "Red Nails" and Paul Jaquays's The Caverns of Thracia, but in a format more readily accessible to inexperienced referees. I can't stress enough how inspirational I found this module when I first read it. Even now, I consider it the best thing Moldvay ever wrote and one of the great adventures of the Golden Age. Compare it to its AD&D contemporary, Pharaoh, which was released in the same year, and Moldvay's genius is all the more apparent. The Lost City is a bit of a throwback in many ways. It presents no story; it's almost pure location and so much of that location is left to the referee to develop for himself, aided only by a few short paragraphs and some maps provided by the module. Despite that -- or perhaps because of it -- I find myself continually drawn back to The Lost City, whereas Pharaoh, a module I loved when it was released in 1982, no longer holds much appeal to me. I find it a pity that it was Hickman's epic storylines that carried the day rather than Moldvay's evocations of pulp fantasy like this one. More than 25 years later, it's hard to judge whether the former created an audience for that style of adventure or whether it simply catered to an already-existing one that Moldvay's style wasn't serving. Either way, The Lost City is an overlooked masterpiece and a reminder of the amazing creativity of the late Tom Moldvay. He is deeply missed. Well, you could always take Dwellers of the forbidden city and use that other great module as a companion to B4. The Lost City is hands down my favorite module for D&D ever published. Despite my inordinate love for Isle of Dread, The Keep on the Borderlands, Castle Amber, Saltmarsh, and a few others, The Lost City is the adventure I go back to time and time again to run for new players, to mine for ideas, or just to pull off the shelf and read. It hasn't aged poorly either - I can pull the module off the shelf and run it with just about any edition of the game (with minor tweaking, of course) and it still works perfectly. Between the various factions vying to take control of the city, the ghosts haunting the tomb, and the evil slime god Zargon, there are enough story elements in the adventure to satisfy even the most story-driven RP-er that I've DMed for. It's actually impressively full of story elements and interesting NPCs if the players choose to go that route (and just as easily adaptable to a "kill 'em all and let the gods sort it out" approach if the table feels like it). I think Moldvay handled that type of design much better here than in Castle Amber, which feels more heavy handed in its plot elements (though it's still an adventure that I love dearly). I heard about the Desert Of Desolation series of modules and would eventually love to play them, but I haven't got that far in my campaign. Campaign consists of stringing B1-B2 (don't know what's next) until A-series,G-series,Q-series. To see what the cultural significance of thse modules was, whe it was first released. You answered most of that question by showing how sword and sorcery literature influenced the game, but the campaign course has been laid out. I created a setting in which these adventures take place, a fairly typical frontier Barony, Baron will eventually send the players on the quest against slavers, and THAT is tied ionto the setting. The very first adventure turned into a year and a half dungeon crawl - I finished developing the Haunted Keep that was outlined in the back of the Moldvay Basic Set. B1 will be a rescue mission - a bunch of teen-agers fancying themselves adventurers will have found the old stronghold located in the territory of the hostile neighbor, where the Baron can not send his men at arns (and risk a war with an unstable neighbor), hence the player involvement. Baron knows the name of the stronghold, but not where it is. Players will have to travel across the county to talk to the lost adventurers friends to figure out where they headed as well as seqrch old manuscripts and records, essentially retrace the expedition's steps to get the dungeon's location (a kindly old wizard living in his tower would have remenbered that a girl dropped by to see him and he gave her permission to see his book collection (as opposed to the magical library). But the wizard does not know what the girl was looking at (one of the volumes is a journal that has the stronghold's location. A couple of ways players can figure out what books the gild was looking at). The stronghold itself will be held by the chaotic raiders unique to the campaign. My players don't know or care enough to customize their characters, but I customize dungeon modules! This is one of my old favorites, too. In fact, I haven't read it in over 20 years -- time for a refresher! A commentary on appropriate threats for low-level characters and the assumed inclusion and application of energy drain from the start of play? I was able to successfully run my first campaign for a year using The Lost City, just expanding on the background information written by Moldvay. It was exactly what I needed as a newbie DM - I started with the module as written, and slowly expanded the base material into my own adventures. The Jim Holloway art is wonderful as well. Tom Moldvay was a genius at putting hundreds of pages of information into a couple dozen. In each of his key works, he'd give you years of playing material in 20-30 pages that would take other authors 10 times as many words to get across. Synchronicity! I've got a post in the queue for later today that mentions B4. I'm going to go link it back to here. "the obligatory wight encounter -- nearly every introductory module includes an encounter with these undead, it seems"
Though I've never actually played B4, I loved the idea and the execution of it—but I also remember feeling let down at first that there wasn't, in fact, a 'Lost City' detailed in the adventure. When compared to the expansive setting of Dwellers of the Forbidden City, it just felt to me to be lacking. That having been said, the ideas and concepts that The Lost City conjures up are impressive in their own right—and I have since come to appreciate the freedom of things that are sketched and left open for GMs to develop. This sounds like something I should pick up. James, why the hell didn't you run this column *before* WotC pulled pdf sales of old books? Well, if anyone asks about the difference between "story" and "roleplaying", you can point them to this module, which contains little of the former, and lots of the latter. It's a good example of situation-based play, a style I find myself turning towards in my current Call of Cthulhu campaign, a game often considered to be story-based. It's a very cool module which I long to run someday. I often see B4 for sale in combination with the Moldvay Basic boxed set on eBay. I'm thinking of trying out my 'swords & sorcery' house rules for S&W with B4. Indeed, the distinction between them was somewhat baffling to us, since we freely bought and used products for both game systems to use in our weird Holmes/AD&D/Moldvay mishmash campaigns. My early gaming groups did the same thing. I originally thought "Advanced" D&D was meant to go between "Basic" and "Expert" for some reason, which is the only reason I bought the AD&D Players Handbook. Same with us. We'd played OD&D, when someone convinced us to switch to advanced, so we bought the Holmes book and the AD&D Monster Manual, not knowing they were for two different games. I have a soft spot for B4. It was the adventure I chose for my Holmes game and which ended up kindling my interest in Original D&D. I had a very similar experience. I was playing Advanced, then saw the Expert set at a friend's house and got very confused. Me three. My godmother bought me the Expert Box and it puzzled the hell out of me. "Expert" sounded like one step beyond "Advanced", but something didn't seem quite right about that. Even though I didn't really use it for play, I often gazed at it: so concise and with such great illos. Anyway, I never saw B4 until a few years ago, when I got back into playing and this whole OSR thing began. It is quite a keen module. One thing you didn't mention which I like is how it has scope for Referee;'e learning to create dungeons. B4 gives you several mapped and keyed levels of the zigguraut and then gives you some sketchier areas below, encouraging the Referee to flesh it out for himself. It is much better, IMO, than B1 in this area. One thing you didn't mention which I like is how it has scope for Referee's learning to create dungeons. B4 gives you several mapped and keyed levels of the zigguraut and then gives you some sketchier areas below, encouraging the Referee to flesh it out for himself. It is much better, IMO, than B1 in this area. My first "original" adventures - meaning stuff I tried to write myself - were my attempts to flesh out the lower levels of the ziggurat, and developing some NPCs for the various factions. I didn't have the confidence to write totally original adventures from whole cloth at the time, but the ideas presented in "The Lost City" by Tom Moldvay were enough to spark my imagination, and to nudge me in the right direction. Thanks for this great post, James. Pharaoh - the entire Desert of Desolation series - was/is phenomenal. It is no more dated than B4. Keep on the Borderlands is the one that springs immediately to mind. My criticism of the Hickman modules is not that they're dated but rather that they took D&D in a very different direction than I would have preferred to see it go. Maybe I'm in a small number of people who never liked the Desert modules at any time. I got them, looked at the plot-heavy stuff inside, and said, "How would I ever run this?" Never even wanted to try. "How would I ever run this?" We played Pharaoh as a straight up dungeon crawl with the ghost Pharaoh's soliloquy as little more than a basic adventure hook. I still occasionally read - and am inspired by - those modules. You could have a rip roaring good time with just the dungeons in each of those modules and throw away the rest if you wish. Hickman wasn't the death of old school gaming, it was what marketing found out you could do by building franchises that changed everything. It's kind of strange that only now with a "revival" in interest in the older classical versions of d&d and Ad&d that I can seem to find so much info on all the old modules,,,sigh..If only I had had access to them in my youth. Of course now that I've done the work to acquire at least pdf's of almost all these old greats, I have to find (create) a group to play them with. incidentally if anyone has ideas on how we older ex-players can make new groups I'd be interested in your input. Back on topic (somewhat) I was so fortunate the the Moldvay module "isle of Dread" came with the expert set, cause we played the h@ll out of it, and to this day my brother says it was one of the best adventures we had ever had. I know that there is a lot an antipathy for the latest edition, but the DMG 4E identifies "The Lost City" as one of the great modules in D&D's roster as well. Funny you mention B4 now, I am going to run it for a group of newbie this weekend...D&D at its best! Certainly he wasn't, but he was nevertheless a prime mover behind a shift in the design philosophy of D&D modules -- a shift I consider to be one of the nails in the coffin of the old school. Found B4 at game store in the mall that specializes in "vintage" games. I am going to run B4, B3, X2 and the rest in a big campaign. And I Am freely mixing D&D and AD&D. Not sure what rule set to use yet though, AD&D, D&D, OSRIC, or even BFRPG/LL. So many choices. Im astounded. yesterday I could finally see a copy of the Lost city in his 80´s Spanish edition. The fact its that they ¡¡¡completed!!! the dungeon. They added the next Tiers of the pyramid and a map of the underground city. ¡Just Incredible! 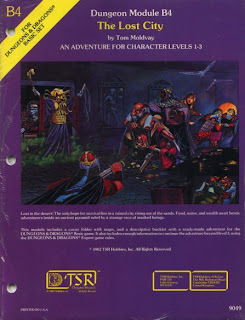 This module was my first exposure to D&D back in 'the day'. I remember rolling up my character, a Magic User named "SPIT" (don't ask, I was in 7th grade), and begining to explore the ziguarat. I recall firing off my one magic-missile, then flailing away with a dagger... We never got far in the module, but this adventure certainly secured my love of D&D. This was the first adventure I dungeon mastered. Would have been 1984. You're totally right that it really allows for a DM to run with it and add their own ideas, almost by accident. I'm sure I just followed the dungeon crawl, I was 12. I still play using the Rules Cyclopedia. Version 4 scared me back to it.